9 1/2 Hour Deep-Sea Reef & Game Fishing Trip. DESTINATION: On the half day charters we travel between 10-20km offshore and fish in depths of 33-50 metres (18-36 fathoms). Travelling time is approx. 15-30 minutes. BYO: Sunscreen, Hat, Sunglasses, Alcohol, Esky For Your Catch (Please leave in your car for transport only, esky’s are not allowed on board as they take up deck room), Seasickness Tablets & Camera. IMPORTANT: Customer must contact Fish The Deep on 0755289578 or 0416224412 between 6:00pm-6:30pm the night prior to the charter to confirm booking and weather and boating conditions. Vessel Departure Location: The Spit Pontoon, Muriel Henchman Drive, Main Beach, Qld. 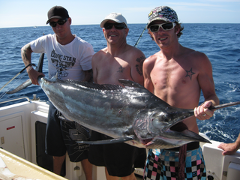 Reef & Game Fishing Half Day A.M.
Reef & Game Fishing Half Day P.M.
5 1/2 Hour Deep-Sea Reef & Game Fishing Trip. 9 1/2 Hour Deep-Sea Reef & Game Fishing Trip. Please note the booking QTY is set to 12 on the order form to reserve the boat for your charter. This charter accommodates up to 12 anglers. Please note the booking QTY is set to 12 on the order form to reserve the boat for your private charter. This charter accommodates up to 12 anglers. 9 1/2 Hour Deep-Sea Reef & Game Fishing Trip. Please note the booking QTY is set to 12 on the order form to reserve the boat for your charter. This charter accommodates up to 8 anglers. Please note the booking QTY is set to 12 on the order form to reserve the boat for your private charter. This charter accommodates up to 8 anglers. 5 1/2 Hour Deep-Sea Reef & Game Fishing Trip. Please note the booking QTY is set to 12 on the order form to reserve the boat for your charter. This charter accommodates up to 8 anglers. Please note the booking QTY is set to 12 on the order form to reserve the boat for your charter. This charter accommodates up to 8 anglers. 9 1/2 Hour Game Fishing Trip. Please note the booking QTY is set to 12 on the order form to reserve the boat for your charter. This charter only accommodates up to 8 anglers. Please note the booking QTY is set to 12 on the order form to reserve the boat for your charter. 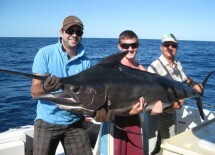 This charter only accommodates up to 8 anglers. DESTINATION: On the half day charters we travel between 10-20km offshore and fish in depths of 33-50 metres (18-36 fathoms). Traveling time is approx. 15-30 minutes. 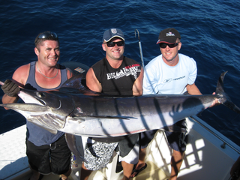 On the full day charters we travel between 10-35kms offshore and fish in depths of 50-95 meters (36-50 fathoms). Traveling time is approximately 35-50 minutes. PRIVATE Game Fishing Half Day A.M.
5 1/2 Hour Game Fishing Trip. Please note the booking QTY is set to 12 on the order form to reserve the boat for your charter. This charter only accommodates up to 8 anglers. PRIVATE Game Fishing Half Day P.M. PRIVATE Game Fishing Half Day P.M. Please note the booking QTY is set to 12 on the order form to reserve the boat for your charter. 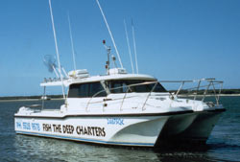 This charter only accommodates up to 8 anglers.